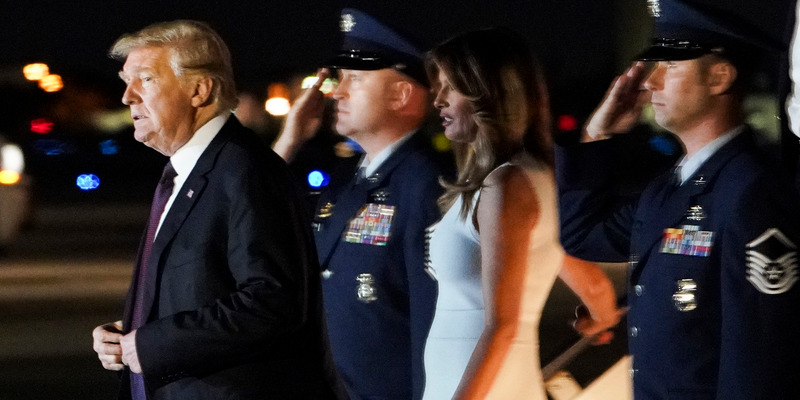 MANDEL NGAN/AFP/Getty ImagesUS President Donald Trump and First Lady Melania Trump step off Air Force One upon arrival at Palm Beach International Airport in West Palm Beach, Florida on November 20, 2018. – Trump will be spending the Thanksgiving holiday at his Mar-a-Lago resort. 1. Trump’s go-to trade report card is starting to look downright deficient. According to the US Census Bureau, the goods trade deficit – the president’s very reason for triggering a trade war – hit $US77.2 billion in October. That’s a record. 2. Investors down on Apple’s glum iPhone sales should perk up over this hidden goldmine. Apple shareholders who get too caught up in the iPhone news are missing a big reason to be bullish about the tech giant’s stock price, says Wedbush analyst David Ives. 3. Stormy Daniels claims her lawyer, Michael Avenatti, sued Trump without her permission. The adult-film actress whose real name is Stephanie Clifford, says Avenatti filed a defamation lawsuit against President Donald Trump without her approval. 4. Furniture giant IKEA is about to give its unhappiest US employees a pay raise. IKEA US said on Wednesday that it plans to bump up the pay of its merchandising basics employees. 5. Former Trump campaign aide and current inmate at a federal prison camp in Oxford, Wisconsin, George Papadopoulos is in trouble … again. Investigators are probing a letter that claims Papadopoulos said he was chasing a rich Russian business deal for himself and Trump post-election. 6. The US Senate has voted in favour of ending US support for Saudi Arabia’s war in Yemen. A resolution, which called on the president to remove most US troops stationed in Yemen, passed by almost 2 to 1. 7. The White House doesn’t really know how to play Trump’s ‘Space Force’ idea. Space Force, you will recall, is President Donald Trump’s highly anticipated sixth branch of the military. 8.The US president retweeted a divisive meme.Basically, its about Trump’s usual political foes, but this one also includes an image his deputy attorney general, Rod Rosenstein. 9. South Carolina Prison inmates running a sextortion ring have scammed US troops out of hundreds of thousands of dollars. Aided by civilians, the inmates scammed hundreds of Army, Navy, Air Force, and Marine Corps personnel. And this is how they were caught. 10.You may have missed the most explosive comments from Facebook’s grilling at Westminster. We did not.